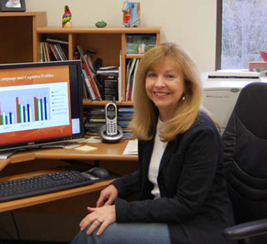 Professor Susan Ellis Weismer investigates the developmental course and nature of language processing in atypical language learners compared to those with typical language development. Populations of interest include late talkers, children with specific language impairment (SLI), and young children with autism spectrum disorders (ASD). One line of research is focused on examining linguistic processing abilities of toddlers with late onset of language development compared to those with typical patterns of language acquisition. A longitudinal project investigated variables that predict language outcomes at kindergarten and assessed links between early limitations in linguistic processing capacity and subsequent diagnosis of SLI. This research has shown that early novel word learning abilities are predictive of early grammatical skills (mean length of utterance) in late talkers and that language comprehension at age 2 is the best predictor of children's language production skills at kindergarten. An ongoing project, conducted in collaboration with the Saffran lab, is examining familiar and novel word learning in late talkers using a 'looking-while-listening' paradigm to explore these children's sensitivity to phonotactic probabilities within target words. Another area of research is directed at studying language development patterns in young children with ASD. A longitudinal investigation focused on characterizing early language and communication abilities of toddlers on the autism spectrum and examined the overlap between late talkers with and without autism to evaluate the 'distinct category' versus 'dimensional' accounts of language disorders. This work produced further insights into the extent of overlap between various populations of children with language delay and led to improvements in early differential diagnosis. Another area of research is aimed at characterizing the nature of language deficits in school-age children and adolescents with specific language impairment. This research examines a limited processing capacity account of SLI, focusing on the role of working memory in spoken language and reading comprehension. In addition to its relevance for defining the SLI phenotype, this research seeks to establish clinically useful assessment measures and to inform language intervention programs for children with SLI. See Language Processes Project publication page.